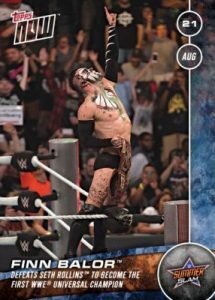 Showing the inevitable shift for all Topps' licenses to the real-time market, 2016 Topps Now WWE is the latest instance that allows collectors almost-instant cardboard access to notable moments and events. 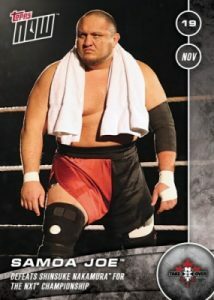 The wrestling line follows the regular Now model of 24-hour sales windows for each release through Topps.com. 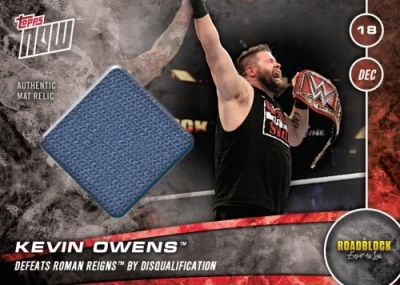 Explaining the decision to include WWE in the Topps Now lineup, Jeff Heckman, Director of New Product Development and eCommerce Marketplace, said, "WWE is the perfect fit to incorporate into the TOPPS NOW program immediately. 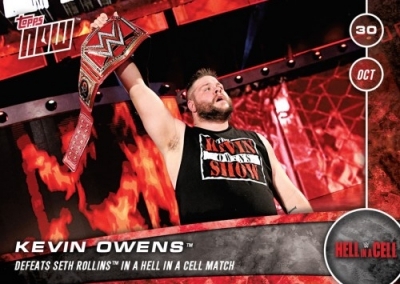 The WWE Universe can now have their favorite moments captured with Topps NOW WWE for a collectable to treasure forever." Cards ship within three to five days after the sales period has ended and the pricing includes SmartPost shipping. Final prints runs are revealed following the end of the selling window for each card. 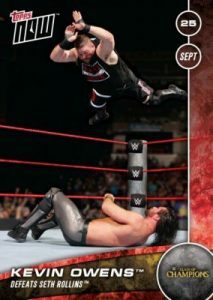 Shop for available Now WWE cards on Topps. Following listings below to shop for earlier releases on eBay. Shop for available Now NXT cards on Topps.